We will more than likely be able to supply a Pallet Truck to match your requirements from stock and if not, we can manufacture a special bespoke pump truck for you at a reasonable price! Please call one of our trained professionals on 0845 458 8025 to discuss your requirements. 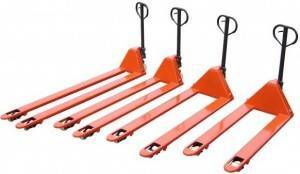 We can supply special bespoke size pallet trucks with a variety of fork sizes, fork lengths and overall widths. This includes pallet trucks with very long or short forks as well as pallet trucks with very wide or narrow overall widths. These type of pallet trucks are usually required for different applications such as for the handling of non-standard pallets for unusual loads and such. Where the preferred pallet truck fork size is not standard or in stock we can manufacture bespoke special size pallet trucks to meet customers’ specific requirements. Special bespoke pallet trucks are the non-standard pallet trucks that our manufacturer design to suit customers’ requirements. They are usually required to suit specific warehouse, construction, factory and other industrial applications. We can also modify some standard pallet trucks to suit specific applications where possible. Examples of these type of pallet trucks include: single fork pallet trucks, adjustable pallet trucks, reel carrying pallet trucks, 4-way pallet trucks, ATEX approved pallet trucks, drum handling pallet trucks etc. Call us or email us with details of your requirements and we will be more than happy to help! Special short versions of our LTLLT model pallet truck are available from stock. In-between sizes and different widths can be manufactured to order. The LTLLT hand pallet truck can be supplied in any fork size. We can offer widths from 160mm (single fork) right up to 2500mm across forks. The fork lengths can be from 500 to 4000mm. Extra long bespoke pallet trucks are ideal for industrial or construction applications where large or double pallets may be used. These extra long pallet trucks come with 2300KG capacity as standard, but we can offer 3000KG and even 4000KG made to order. You can view the full range HERE as well as on our sister site Pallet Trucks UK.